As a Chocolatier over at Crop Chocolate, I earn a credit each quarter and in return create/submit one project with the items I purchased. This quarter, I was thrilled to see brand new Echo Park Christmas - the "Everybody Loves Christmas" paper pack. 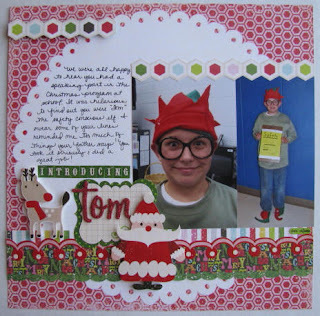 The paper pack includes 12 double-sided sheets of patterned paper, a 12x12 sheet of embellishment stickers, and a 12x12 sheet with FOUR different alphabets and 12" border strips. 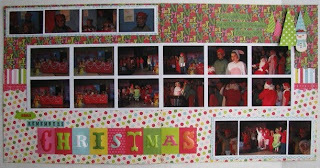 The first layout I made was to document Blake's role in the school Christmas play last year. We all cracked up when we heard that he was Tom the elf and that the elf had a personality like Tom! I had fun layering different patterns on this layout and grouping the stickers from the elements sticker sheet. With some pop dots, they became instant dimensional accents. I had a ton of shots of Blake and the cast and decided to make a 2-page spread with these shots. After I had the layout finished, I realized I should have added the program which includes the list of characters/actors. I cut a slit in the upper right hand corner of the layout a little wider than the program. Then I flipped the page over and adhered a piece of kraft paper to the back of the layout to keep the program from slipping around. I also added a tab labeled with "program" to identify what is peeking out. The elements stickers provided me with supplies for another embellishment grouping in the lower left corner of the layout. Even though I printed my "live action" shots of the play in 4-up collages, I probably still had too many to include in one 2-page spread. Needless to say, this layout isn't my favorite, but it's a completed layout. I am getting a lot of use out of the elements stickers (big tree & snowman). 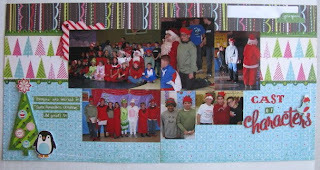 I cut additional trees out of one of the patterned papers to use as the background of my grouping. My title is a mix of stickers and letters from the patterned paper. I felt that it was really "flat" so I used Stampin' Up's Crystal Effects over the letters to add some dimension. Great layouts, love the details and design! The way you included the program was very clever! What a fun LO! I love the "introducing tom" LO! And I love those red glitter alphas!! I'm gonna need to get those!! Great job Amy! The element stickers look great popped up and shiny.